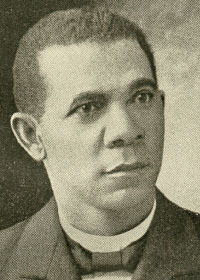 Booker Taliaferro Washington, a distinguished American educator, was born a slave at Hales Ford, Virginia. In 1881 he became the head of an institution at Tuskegee, Alabama, since incorporated as the Tuskeegee Normal and Industrial Institute, of which he was president until his death on November 14, 1915. Author of Up from Slavery in 1901, he was viewed as a spokesman for USA blacks in the latter 19th century. "Washingtons continued efforts to control black public life were manifested in this period by his private efforts to control the actions of two fraternal orders of which he was not a member. He was successful in keeping one of his supporters as editor of the Odd Fellows' Journal, but after heated debate the Prince Hall Masons withdrew their invitation to Washington to be the orator on the occasion of their centennial celebration." Source: Denslow; The Booker T. Washington Papers, Louis R. Harlen, et al ed. vol. 9, 1906-1908. p. xxiv. <stills.nap.edu/btw>.